The president also portrayed the election as a decision between democracy and authoritarianism, grouping together fascists, communists, and jihadists with "homegrown demagogues" as those bound to fail. Obama and Clinton embrace after his speech to the Democratic National Convention in Philadelphia. (Image via the convention's Twitter account). PHILADELPHIA: President Barack Obama capped off a night of speeches by boldface names at the Democratic National Convention in Philadelphia by balancing a message of optimism with a strong endorsement of Hillary Clinton and pointed criticism of Donald Trump. Obama aimed to contrast the pessimistic viewpoint voiced by the GOP nominee and other Republicans at their national convention in Cleveland last week with the Democrats’ more positive tone. "America is already great. America is already strong. And I promise you our strength and greatness does not depend on Donald Trump," he told the crowd at Wells Fargo Center in Philadelphia. "What we heard in Cleveland last week wasn’t particularly Republican and it sure wasn't very conservative. What we heard was a deeply pessimistic version of a country where we turn against each other and turn away from the rest of the world." Obama also billed the choice of Clinton versus Trump as one of democracy against authoritarianism, saying, "We don’t look to be ruled." 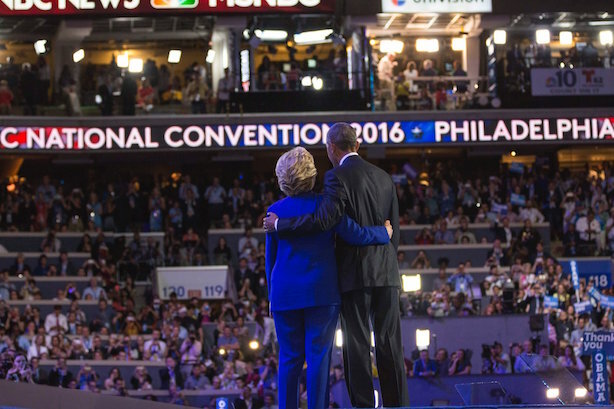 Clinton joined Obama on-stage after his address. Obama followed vice presidential nominee Tim Kaine, Vice President Joe Biden, and former New York City Mayor Michael Bloomberg, who was first elected to City Hall as a Republican in 2001. In a fiery speech, Biden panned Trump’s overtures to the middle class, saying, "This guy doesn’t have a clue about the middle class, not a clue." "His cynicism is unbounded. His lack of empathy and compassion is summed up in the phrase he’s made famous, ‘You’re fired.’ Think about that; think about everything you learned as a child," Biden said. "How can there be pleasure in saying ‘you're fired?’ He’s trying to say he cares about the middle class. That’s a bunch of malarkey." Biden’s address preceded a speech by Bloomberg, who took on his fellow New Yorker by questioning his temperament and fitness for office and praising Clinton as a "sane, competent person with international experience." "Donald Trump has left behind a well-documented record of bankruptcies," he said. "Donald Trump says he wants to run the nation like he’s running his business? God help us. I’m a New Yorker, and I know a con when I see one." Kaine, in what was essentially his prime-time introduction to the country, gave a biographical speech, as his counterpart on the Republican side, Mike Pence, did a week before. However, Kaine also poked fun at Trump’s habit of saying "believe me," arguing voters could not afford to do so after looking at the GOP nominee’s history in business and mixed in Spanish with English. "Most people, when they run for president, don’t just say ‘believe me;’ they respect you enough to tell you how they’re going to get things done," he said. "Here’s the question: do you really believe him? Donald Trump’s whole career says you better not." The third night of the Democratic convention followed another day in which Trump’s comments dominated headlines, this time his statement that the Russian government should "find [Clinton’s] 33,000 emails that are missing." The comments were called irresponsible or worse by several prominent diplomatic and intelligence officials. Trump also held an Ask Me Anything session on Reddit on Wednesday evening.